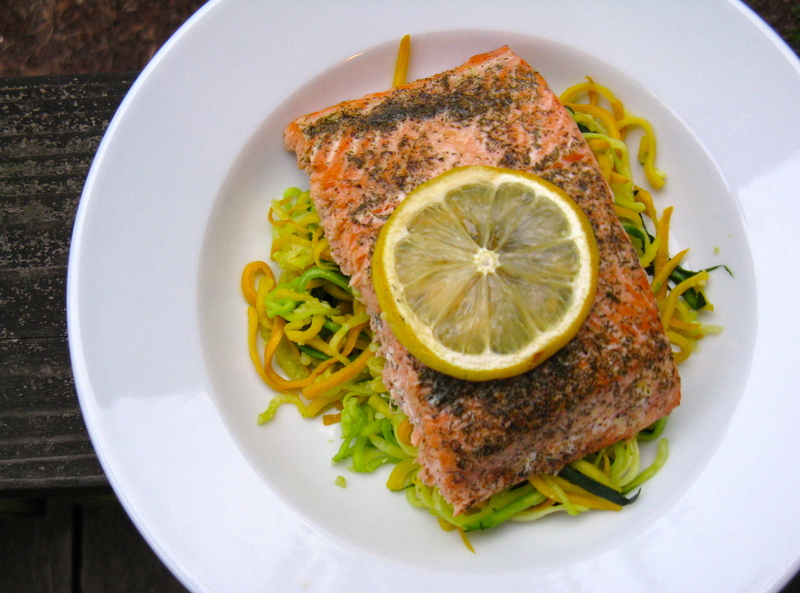 I’ll be honest…I feel kinda silly posting this lemon dill salmon with buttered zoodles. It’s seriously so simple! But, there’s nothing wrong with simple and who doesn’t want an easy, healthy recipe? Not only that, but as basic as this recipe and ingredient combination is, it’s really delicious and makes for a nice summer meal. As for my weekend, I work a couple hours out at Clackamas Physical Conditioning with Jason tomorrow morning and then will come back to town and run the usual errands with Jesse later in the day — mainly just grocery shopping. The rest of Saturday is open to whatever I want — yeah! I work at Recreate Sunday morning and then later, Jesse and I are going to a friend’s house out in Scapposse to have dinner and drinks, and also pick some veggies from their garden. Preheat oven to 400 degrees F. Line a 9×9 pan with foil or parchment paper. Place fish fillets skin side down in the pan. Brush on the melted butter, ghee or coconut oil and sprinkle with sea salt and pepper. Then, sprinkle the dried dill atop of the fillets. Pour fresh lemon juice over each fillet and then place one of the rounds atop of each, in the center. Bake for 15-18 minutes or until fish is cooked through. Serve atop of buttered ‘zoodles’ (directions below) and squeeze on extra lemon juice, if desired. Peel zucchini with a julienne peeler or use a spiralizer if you have one. Sprinkle the zoodles generously with sea salt and then place in a fine mesh strainer to “sweat.” Allow the water to drain from the zoodles for 15-20 minutes. After 15-20 minutes, squeeze out any excess water from the zoodles with your hands. Then, place in a microwave safe bowl and heat for 45-60 seconds. Once warm, add the butter and toss. Of course, you can briefly heat the noodles in a skillet on the stove and toss with butter. 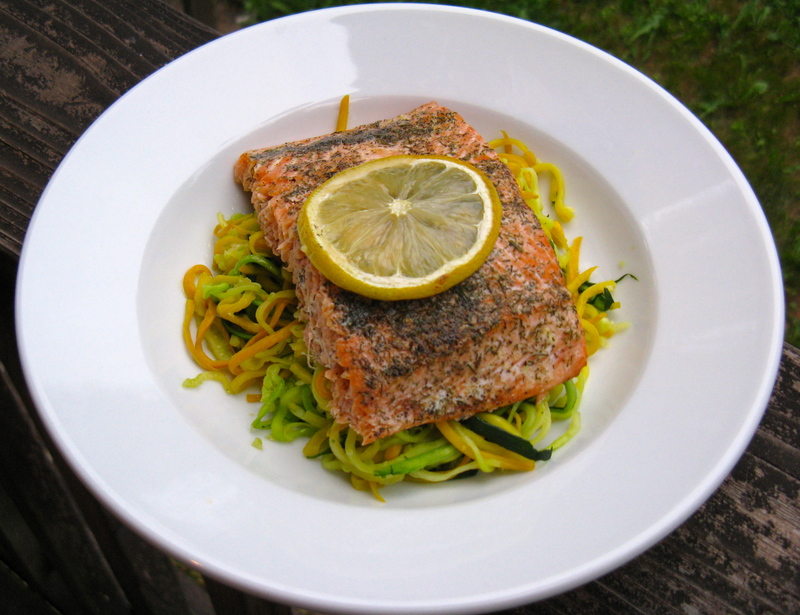 Bet you’re loving your new spiralizer! 🙂 we will definitely have to try it out! Love salmon! But even better, I love your simple recipe ideas. This is great, glad you decided to post it. Thanks for your kind words, Alfonso!